ARRI CSC is pleased to announce that Chris MacKarell has been promoted to Digital Workflow Manager. He will continue to oversee ARRI CSC’s Digital Workflow and On Set activities for New Jersey and Florida facilities while at the same time contributing to ARRI Rental Group product development and Technical Marketing. MacKarell’s extensive experience in digital media spans fifteen years in the post sector. Starting out as Manager Media Illusion Support for Avid Technology Inc. he then worked for NBC Peacock Productions as Senior Avid Finishing Editor. In 2010 he joined Deluxe where he managed special projects, rolled out infrastructure improvements and new workflow designs. As Senior Engineer/ Workflow Architect for Technicolor he then designed, tested and implemented project-specific workflows. 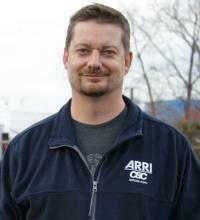 Chris MacKarell joined ARRI CSC in 2011 as Digital Workflow Specialist. ARRI CSC is a fully owned subsidiary of ARRI Inc. Trading as ARRI CSC in New Jersey & Florida and as Illumination Dynamics in Charlotte and Los Angeles, the Group offers rental equipment & services to the feature film, television, broadcast & events markets. For locations and more information, visit www.arricsc.com. With headquarters located in Munich, Germany, Arnold and Richter Cine Technik (A&R) was founded in 1917 and is the world’s largest manufacturer and distributor of motion picture camera, digital intermediate (DI) and lighting equipment. The ARRI Group comprises a global network of subsidiaries, agents and representatives that covers all aspects of the film industry: design, engineering, production, equipment rental, turnkey lighting solutions, postproduction, film and sound laboratory services, and visual effects. Manufactured products include the groundbreaking ALEXA digital camera system, film cameras, professional camera accessories, cutting-edge LED lighting and DI solutions such as the ARRISCAN and archive tools. The Academy of Motion Picture Arts and Sciences has recognized ARRI technologies and continual innovation with 18 Scientific and Engineering Awards. For locations and more information please visit www.arri.com.